Ground Fault Circuit Interrupters are safety features in your home electrical system. These outlets and devices reduce the risk of severe or fatal electric shock by monitoring for electrical current loss/leaks or "ground faults". If the outlet notices a leak (this is measured by 6 milliamps or more of the electrical current leaving the device is not returning), they are designed to shut off the electricity to protect you from being electrocuted. By detecting dangerous current flow and instantly shutting off power, ground fault circuit interrupters save hundreds of lives every year. Anywhere close to water. They are typically near kitchen sinks, in bathrooms near sinks, tubs, whirlpool and showers, exterior outlets, garages, hot tubs and near laundry tubs. Some areas that you may not want a GFCI are: sump pump, freezer, fridge and sewage ejector. If the GFCI trips, it could have costly impacts to your home, especially a sump pump. GFCIs can be special breakers in your electrical panel (look for a Test button) or special receptacles (outlets) with Test and Reset buttons. Often you can find the letters “GFI” or “GFCI” on them. A Circuit breaker GFCI is installed in the electrical panel box. This not only allows the GFCI to protect selected circuits that may encounter a ‘ground-fault,’ but it will also trip when there is an electric short or overload. 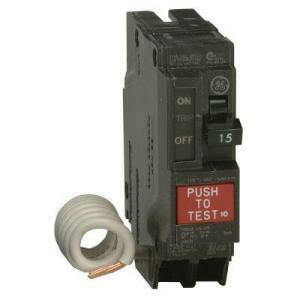 GFCI circuit breakers feature a "test" button on the front that you can use to test that it's working properly. This is the same sort of feature you find on GFCI receptacles (see below). 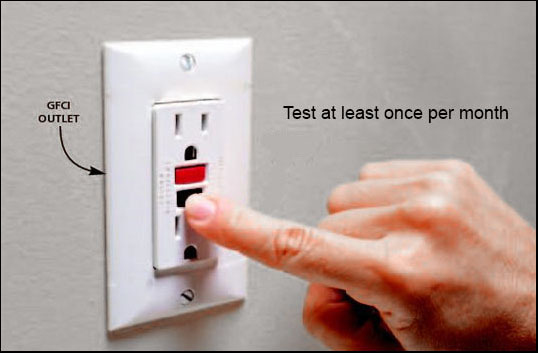 After you press the "test" button you will have to reset the breaker to turn the circuit back on. The curly white wire pre-attached to a GFCI breaker must be tied into your breaker panel neutral bar when installed by a qualified electrical contractor. Note: When you test, this will disconnect the power to everything on that circuit until you reset the breaker. This is the most common type used. This type of GFCI fits into a standard outlet box and protects against "ground faults". This ensures that any electrical device plugged into an outlet is protected from "ground faults". These units can be plugged into an outlet and in turn, the electrical device is plugged into the GFCI. This adds extra protection to plugged in devices when a circuit breaker or receptacle circuit GFCI is not in use. Keep in mind that portable GFCIs should only be used on a temporary basis and should be tested prior to use. 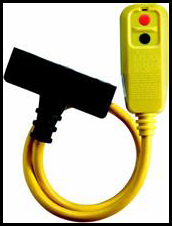 #1 : Use a Circuit tester To test the GFCI with a circuit tester, plug in the tester and push its TEST BUTTON (see below). If the power to the outlet goes off, the GFCI is working. Press the GFCI reset button to restore power. If the power doesn't go off, the GFCI should be replaced. #2 : Press the reset button Push its test button. If the power goes off to the outlet, the GFCI is working. 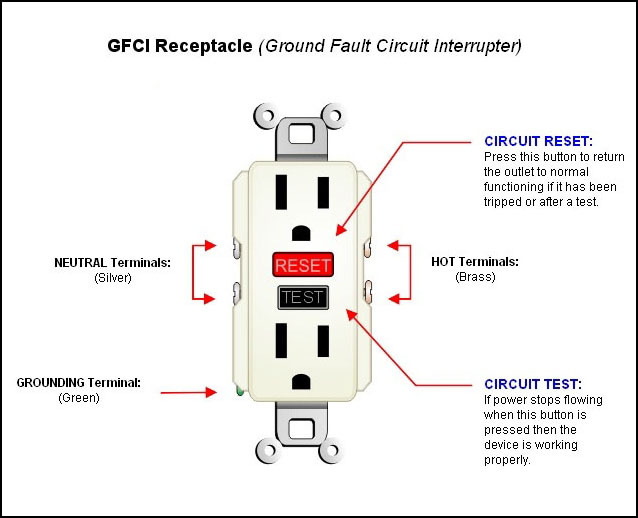 Press the GFCI reset button to restore power. If the power doesn't go off, the GFCI should be replaced. Note: The reset button alone won't tell you if a pre-2006 GFCI outlet is still working properly - you'll need to check it with # 1 above. Test once a month and after thunderstorms. All GFCIs manufactured after mid-2006 are designed to tell you when they fail. The vast majority indicate failure by shutting off power permanently. So someday your GFCI (and any other outlets connected to it) may simply stop delivering power and the GFCI will need to be replaced. Testing of GFCI receptacles are standard part of Inspected by 42 home inspections.